zessn schoolhouse: #016 HOW BIG IS BIG ENOUGH? #016 HOW BIG IS BIG ENOUGH? 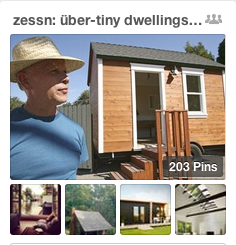 I've written before about how much I love tiny buildings and how smaller homes would be beneficial across the board. But what exactly is the environmental component to size (since this course is on sustainability)? To understand some of the impacts of "biggering," first read The Lorax by Dr. Seuss. One of the coolest things that happen when we build smaller is reducing the impact on the land. In the city, smaller apartments and flats can be combined together on the same property. Buildings can even share an exterior "party wall" and eliminate side yards altogether. For people who like some open space (all people like open space! 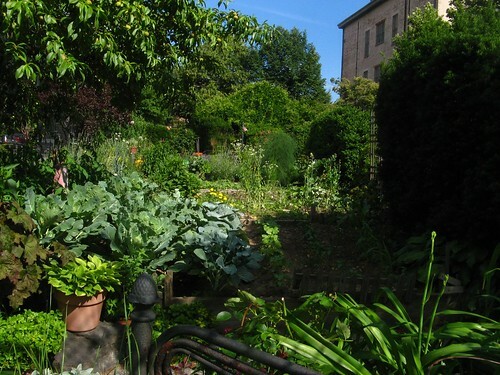 ), that means that postage-stamp sized yards can then be replaced with community parks and gardens and courtyards. In more rural areas where land is not as scarce, small buildings still make better use of the land. Whether we're talking about a collection of buildings on a farm, (where uses are better separated: don't put the piggies in the room next to mine!) or a collection of homes (that can share a smaller yard area that must be groomed for gatherings & kids to play in), smaller is better for taking care of the land. It leaves more land available for wilderness, open space like parks, agriculture and just staying purposefully undeveloped. Undeveloped land is a resource we are quickly running out of. In suburbia where each plot is typically assigned and almost never communal, small buildings leave more of the lot for outside use. Have you seen neighborhoods where the houses are WAY too big for the lots? It's strangely confining and claustrophobic. And no one ever spends any time outside! Where did the materials come from & how much energy was spent on transporting them? Were the materials recyclable themselves, or would they end up in a landfill at the end of the building's life? Were the materials "local" in the sense that their character reflected the character of the region? What is the embodied energy of the materials? The question is pertinent because of overall calculations. 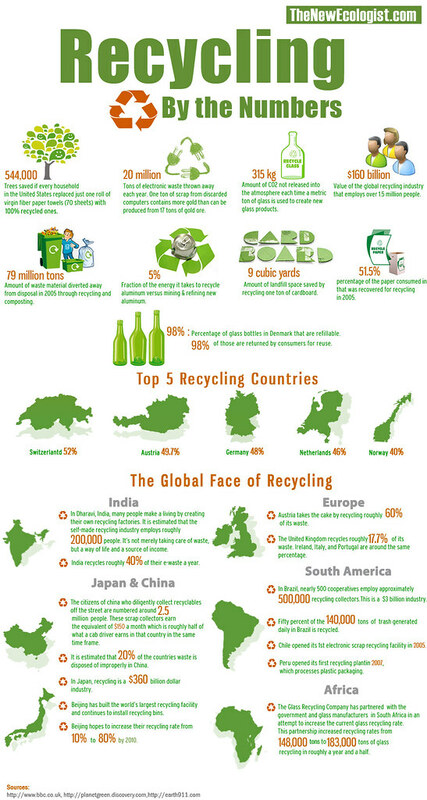 Most sustainable building tools want to know a percentage of materials that are recycled or local. But what about a TOTAL number? 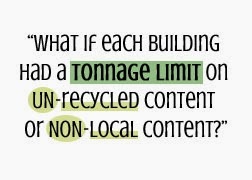 What if each building had a tonnage limit on how much UN-recycled content or NON-local content? That would really be a game changer. EFFECTIVE PRICING. For a building to be cost effective, it often has to be of a minimum size: every subcontractor will give a better price per square foot if he can distribute his overhead across more square feet. Contractors will not bid jobs they don't think they can deliver a good price on. MONEY. The bigger a building, the more they get paid; and this isn't greed talking. 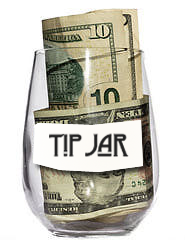 Architects often break even or lose money on most jobs. They count on the bigger projects to help them stay afloat. Contractors will typically not do a job they can't make a profit on, so their business is better protected, but they still need that profit to pay their employees well and grow their company. *For further rather believe-it-or-not inspiring reading on the life of a material, check out Cradle to Cradle by Bill McDonough. He's been at the forefront of this kind of thinking for decades... my copy of the book is not made out of paper, but recycled plastic that is waterproof and also recyclable with soy-based ink. Smart. THIS is what Mr. McDonough is up to right now.... not exactly small. Look for the homework next week!